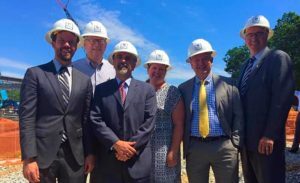 On June 7, 2016, the College P ark City-University Partnership (The Partnership), in collaboration with Wood Partners Real Estate, the City of College Park, and the University of Maryland, orchestrated the groundbreaking ceremony for the new 275-unit luxury apartment building being constructed at 4700 Berwyn House Rd. The goal: to celebrate the development of only the second housing project in College Park focused primarily on young professionals and families. 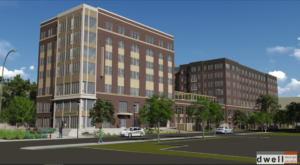 The apartments will provide significant amenities including a resort style pool, a media viewing room with a wet bar, a state of the art fitness center and a dog spa. Construction is expected to be completed by June, 2017. Upon completion, the apartment will be well-positioned to retain University of Maryland graduates, faculty, and staff, as well as attract young professionals to live in College Park – a key strategy of the Partnership’s University District Vision 2020 that the City of College Park and the University of Maryland adopted in 2011. The University District Vision’s goal is to make College Park a top 20 college town by 2020. The event was well attended by community leaders, City, University, County and state leaders, and those involved with the financing, development and construction of the project. Speakers included Scott Zimmerly of Wood Partners Real Estate, College Park Mayor Patrick Wojahn, Carlo Colella, the Vice President of the University of Maryland and Senator Jim Rosapepe. Each spoke about this project’s role in creating a stronger, more thriving university community, and contributing toward a more transit-oriented, smart growth future in College Park. The press event attracted media from College Park and Washington D.C.